Maximize the performance benefits of your protein supplement. Undigested protein will simply be excreted from the body, resulting in increased kidney stress and wasted amino acids, essentially pouring your expensive protein supplement down the toilet. When dietary protein is not broken down into its smallest components, large peptides are created that can cause stomach discomfort such as bloating, nausea and cramping. These symptoms should not be confused with food intolerances; generally, the underlying cause of protein-induced stomach discomfort is peptide sensitivity. Aminolase breaks down these large peptides, reducing the potential for discomfort that often comes from consuming protein supplements or dietary protein. Arginine. (Arginine has amazing nitrogen retention ability. Nitrogen is one of the key elements in muscle protein synthesis. Some plants can absorb nitrogen, but we mammals have to make do with the stuff we make ourselves. It enhances the immune system, stimulates the size and activity of the thymus gland which makes it a prime choice for anyone in a condition that is less than optimal for health, such as people recovering from injury and hiv patients. Arginine is also a precursor of very important molecules such as creatine and gamma amino butric acid (GABA, a neurotransmitter in the brain). The hormonal release properties include releasing insulin from the pancreas and a massive stimulator in the manufacture of GH (Growth Hormone) from the anterior pituitary. It increases blood flow. It also improves the health of the liver, skin and connective tissues and may lower cholesterol. But mostly it facilitates muscle mass gain while limiting fat storage, because it keeps fat alive in the system and uses it. It's key in weight control.) increased by 150%. A huge increase, greater than 2.5 times the level obtained from using whey isolate alone. Glutamine (Glutamine is a non-essential amino acid that is present in the body in large amounts. At some times it forms 60 percent of your total amino acid pool. Because it passes through the blood-brain barrier rather easily it's often called brain-food. In the brain it converts to glutamic acid, which is essential for brain functioning and increase gaba (gamma-amino-butyric-acid, another popular supplemented amino) needed for mental activities. It is used in synthesis of muscle-tissue. It is a nontoxic nitrogen carrier. Most important perhaps is that it balances the acid/alkaline level, so it reduces lactic acid.) increased by 45%. As a general rule, the body does not have all the tools needed to disassemble all dietary protein, especially protein supplements. Aminolase is necessary to ensure that the body is flooded with all the amino acids needed to build muscle and recover from intense exercise. 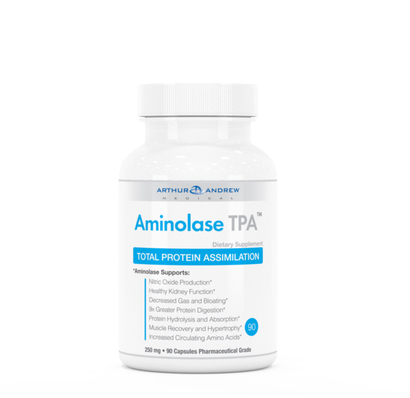 Aminolase on its own is bio-sufficient, meaning the supplement alone includes all the tools required to break down proteins into bio-usable form. Aminolase is a bio-sufficient supplement designed to build muscle mass and accelerate muscle recovery when used in conjunction with protein supplements, meal replacements and all protein-rich meals. Digests protein into bio-usable form, taking full advantage of the availability of essential amino acids for building muscle and improving muscle recovery. Greatly reduces stomach discomfort typically caused when protein supplements are not broken down into their smallest components. Maximizes the performance benefit of dietary protein, assisting the body in absorbing more protein rather than excreting it. Consume 1 capsule of Aminolase™ per 25 grams of protein consumed. Aminolase capsules may also be opened and added directly to your favorite protein supplement. Aminolase is a vegetarian enzyme product which may increase protein bio-availability as much as 1000%. Warning: Aminolase is made with an extremely potent blend of proteolytic (protein digesting) enzymes. Similar to other natural gastric juices such as hydrochloric acid, Aminolase can burn skin, or cause irritation of the eyes and hands. Although this product is safe for ingestion, handle with care when opening capsules. Delivery Methods: When Aminolase is removed from capsules and added directly to protein supplements, the enzymes will rapidly begin converting protein into amino acids. Amino acids have a significantly different taste profile compared to proteins, which may impact taste and texture. When mixing protein directly with Aminolase, taste may become extremely bitter and possibly unpalatable. For best results, swallow capsules and immediately chase with your favorite protein beverage.